So why would Michael be sneaking around his own home? Projective testing suggested a severe agitated depression, a sense of being overwhelmed by a sense of evil and the futility of life. The depression is possibly of psychotic proportions but the protocol was too guarded to be certain. Mental functioning is clearly fragile. Extent of pathology is evident in borderline features: 1) intrusions of personal concerns into intellectual functioning, 2) primitive fantasy content, e.g. mutilated bodies, masked, distorted figures, concerns about bodily integrity and deformity, 3) inadequate capacity for attachment to other people. Now think about how he must have responded [^] the circumstances of October 30, 1975, as someone who Dr. Quinlan further diagnosed as having impulse control that is only marginally adequate. Was Michael able to control his impulses that fateful night? Given everything we know about the highly combative rivalry between these two brothers, and Michael's well-documented psychological problems, there can be no doubt he was extremely upset about what was transpiring. It is not at all unreasonable to assume that he may have wanted to spy on his brother and Martha, to monitor, first-hand, any betrayal. If we accept what Tommy has told us about his sexual encounter with Martha, they were carrying on flagrantly, only 50 feet behind the Skakel residence, in the middle of the rear lawn. Their indiscretion was highly visible, should anyone have been even remotely suspicious. Did Michael have reason to be suspicious? Ample reason. Many people were aware, even before the demonstrative sexual horseplay at the side of the house, that Martha was interested in Tommy. 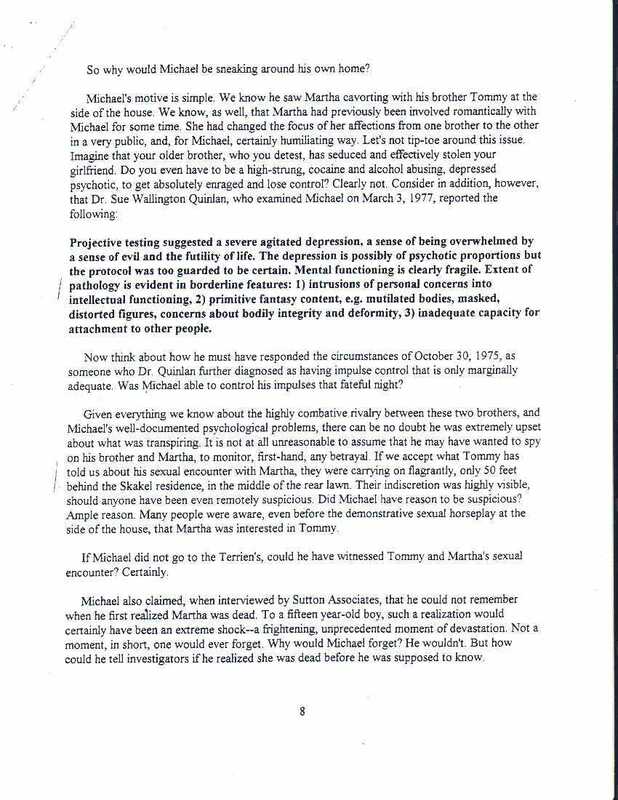 If Michael did not go to the Terrien's [Terriens'], could he have witnessed Tommy and Martha's sexual encounter? Certainly. Michael also claimed, when interviewed by Sutton Associates, that he could not remember when he first realized Martha was dead. To a fifteen year-old boy, such a realization would certainly have been an extreme shock--a frightening, unprecedented moment of devastation. Not a moment, in short, one would ever forget. Why would Michael forget? He wouldn't . But how could he tell investigators if he realized she was dead before he was supposed to know.